Replies: 54 (Who? ), Viewed: 34053 times. I am going to leave the binary posted for a while, because it does not require version 1.7.3 or higher of MilkkShape. In a few more weeks, anyone with a 30 day trial will have expired already, or have registered and can upgrade for free then. I am asking the admins to go ahead and lock the thread now. I will close the thread after 1.7.2 is history, because this version has been superceded by the V2 plugins (which do require 1.7.3 or better). Unless you have a good reason, don't bother downloading these, get the new ones instead. Well, I have learned a few new things that hopefully have improved these two plugins. I closed the previous seperate betas, and am reposting both new plugins together. There is always a method behind my madness. 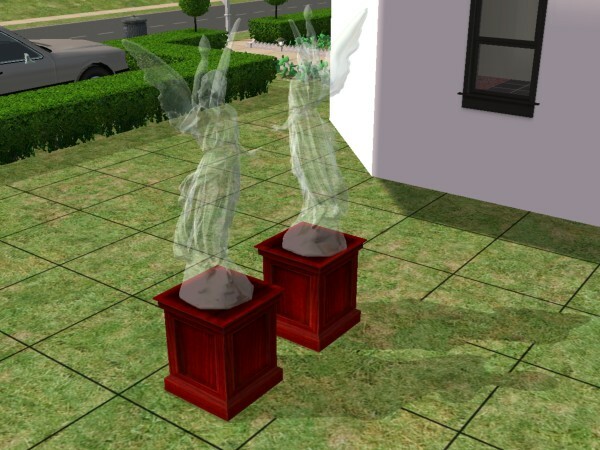 Some of the previous problems with the plugins came about because MilkShape and the Sims2 use different coordinate systems (left-hand and right hand). Essentially, left and right are reversed, and back and up are swapped (specifically, the sign changes on X, Y & Z values are swapped). This applies not only to the vertices, but also to the normals. Speaking of normals, the exporter now handles normals>vertices correctly. WORD OF WARNING ON USAGE WITH OTHER PROGRAMS: The Importer plugin converts the coordinate systems, and the exporter reverses the changes. If you use the importer, then put the mesh in another tool, I can't be sure you will get the results you want. The same goes for importing a mesh from another source and exporting it to the game. You may be able to fix this by rotating the object around the X axis. Also, the importer will warn about the presence of data blocks that it does not handle. These are found in animated objects, and if you proceed with modifying one of these, you may not be satisfied with the results, because with the animation data missing it will not perform as expected. Please read the text file inside the archive for installation instructions (if you used the previous versions, that is the same). Attached: Beta6.1 Exporter and Beta2.1 Importer. Thanks. This explains all my troubles with up and down, left and right when rezising. Now we just can leave the imported clonedata as it is and save testing time. Does the plugins work with both 1.7.2 and the new 1.7.3 ? I have 1.7.2, and when I import any GMDC, it just looks like a 2-d plane. Am I doing something wrong? Does the plugins work with both 1.7.2 and the new 1.7.3 ? You know, I didn't move them over & test the final cuts here with 1.7.3. They worked fine before the latest modifications, and there SHOULD be no reason these two don't work with 1.7.3. I rechecked my version here, and it works fine. I would like someone to check their copy & see if this behavior happens there, please. Peter, fleabay? OK, going to try it now. atavera, it sounds like you are trying to import a gmdc into milkshape. You are not required to have the milkshape importer to get this going. You need Delphys plugin and save the GMDC as an .obj from SimPE. That OBJ file is what you import into milkshape. I think the 2-d plane you see is milkshapes grid. Last edited by fleabay : 28th Jan 2005 at 6:33 PM. Ok. I have played around one hour with 7.1.3 . No crashes. Nice to import directly from extracted GMDC-file and export as the same file again. No obj files involved. (maybee it does but we don t see it?) Importing even worked for SimPE files and all packages i worked with before and changed with the new tool worked fine. I even got this messages about excluded files. I changed one of these "boned" meshes, exported and tested in the game. No change but no crash either. Thanks Wes, things got easier with this importer and i guess the up and down right left changes you made can make me work faster. My milkshape trial ran out and I decided it was a good time to redo my computer from backup. Sorry for the misinformation but I was going from past knowledge. I can't wait to give this a try! Does the GMDC import/export have any advantage over OBJ files? The importer is causing me an extra conversion step in Milkshape, and Milkshape is what I'm trying to avoid. I'm still in the process of testing. Off topic... Why does my sig appear sporadically? Well, I can't single-handeldy write plug-ins for every package out there, particularly the high dollar ones. Personally, I like MilkShape for it's (mostly) ease of use. These two products started out as code to support my own modding research, and required only a little 'dressing up' to be made available to share with other modders. The importer would NOT be a required step in the process, but it does the coordinate reversals in the opposite fashion the importer does. The previous exporter did no coordinate changes, so you had to realign your layout in whatever 3D editor to match the coordinate system used in TS2. I was concerned when I saw atavera's message because I had seen the 'flat plane' effect occur before, but because I had mistyped a value in the source and was assigning two coordinates the same value, but I fixed that, and I was afraid I inadvertantly packaged and uploaded the wrong file. As long as i used packages with single GMDC-files it was easy to get along. When i used one with 4 i got totally confused because of the filesnames which showes up with only numbers and the "geometric...." -twice. Very confusing. Ok, the plugins are working realy fine, but I massed up everything so i was forced to switch back to the old version and make everything again. Maybee there is a teknikal order of proceeding to avoid this? However i would prefer filenames that are not numbers only. As long as i used packages with single GMDC-files it was easy to get along. When i used one with 4 i got totally confused because of the filesnames which showes up with only numbers and the "geometric...." -twice. However i would prefer filenames that are not numbers only. I'd like to look at the GMDC you're talking about. You don't have to upload it if you can tell me the object it came from... I'll find it here (assuming it's a standard game one). I just did a quick test importing the gmdc from the Alienware computer, it has 4 groups and the names were just the same as what they are in the package (as shown in SimPE): casing, screen, cd and groundshadow. I'm pretty sure I don't have any code in that plugin that generates numbers in place of the names. The group names, as imported, should be the same as the model names seen when looking at the GMDC in SimPE under the tab "Items 3" . The one exception here is that MilkShape only allows 31 characters for a group name, so on names longer than that the importer truncates them (but tells you it did). I have a fix for that later, but it will only be for MilkShape 1.7.3 and up. Sorry i should menshioned that this basicly is a SimPE problem for me. When you export a obj -file from SimPE you get the file name within the exported obj -filename, so you can find back when you klick on the GMDC file in SimPE and choose replace with what you have changed in milkshape and exported from there. When i use your importer i only get the numbered file from Simpe-extracted into Milkshape and exporting again it has the same numberfiles. When i have to replace then 3 files in SimPE as with my wallmirror, which one was what?....dealing with numberfiles makes me confused. So this is how i got it but probably i am doing some easy way wrong and more complicated than it has to be? Wes, thanks for your patiance, i am a just lika a baby with all this stuff, never dealed with 3 D and such things i try to do now. I think it comes from flipping normal and vertices to adjust milkshape. But i am not sure of that because the shadow is blocked. Last edited by psyckotic : 30th Jan 2005 at 1:26 AM. I can't find the ms3d.exe program. Am I meant to download it? I'm new to this. Please help. Thanks for the support Fleabay, I found out what I was doing wrong. I was exporting graphic nodes(I'm still a newbie to TS2 graphics ), but I am learning fast. Thanks Wes, this is a truly great plugin, and sims modding tool. Even with Miche's, and Delphy's importing program(which is also a nescessity), we can't load meshes from the game and edit them in our favorite 3d program. I still can't figure out why some complained about it only supporting .obj formats because that can be converted into every 3d format that I have seen except for .max, but milkshape can change it into .3ds, which 3dstudio can import. It cannot be because of the price of milkshape because 3dstudio max costs over $3,000 USD, and I think that Maya costs somewhere near that as well. I get this problem as well. The darkness stays regardless of the direction you face it and it's only on two sides. In my case, I deleted the original item and built something new and it still happened (so it's probably coming from the exporter part?). I don't want to argue with my 'customers', but I wasn't able to replicate your problems here. I suspect that you must be mismatching the versions somehow. Please check that carefully. I posted a screenshot below of work I just did to ty to replicate this. 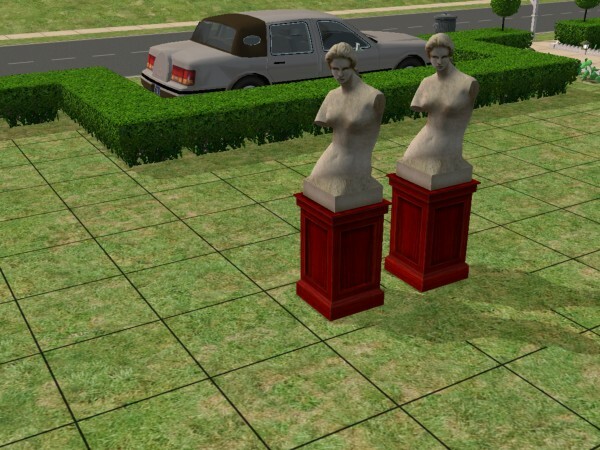 The original Venus is on the left, the clone on the right. I pulled a section of the face in the clone outwards (like a pinnochio nose) in order to assure myself that my imported/modified/exported mesh was what was actually being displayed in the game. There is an extra set of normals for bumpmapping that MilkShape is unable to handle that get left out of the process. You can see the difference in the statue because of this; in particular, look at the belly button, it is less eroded looking in the modified statue, since these normals were not exported (nowhere to save them at on import). I want to support you guys (& gals) however I can, but I can't find any problem using BOTH new plugins. Look at the plugin name under the import and export menus in MilkShape, the Exporter should say 'BETA 6' and the Importer 'Beta 2'. I rename the extracted files I use from SimPE all the time. The numbers are hard to deal with. It creates no problems. 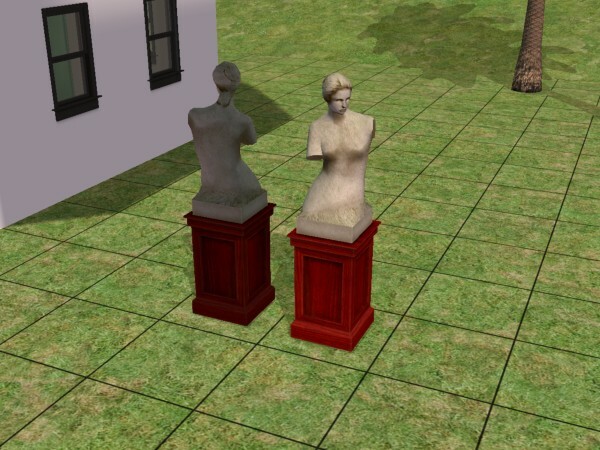 You just have to type something in, like "original_statue_mesh.simpe", for example. After you edit, you can export it to something like "changed_statue_mesh.simpe" so you can revert to the original without having to extract it again, if need be. Then I load up the package in SimPE, select and copy the internal filename (perhaps #7f2a648b!statueMesh_tslocator_gmdc) to the clipboard. Then I right click on the GMDC in the upper-center window, pick "replace", then select my modified mesh file. After it loads, I highlight the internal filename and paste the previously copied name. Click Commit, save, exit and admire your new work! (This all assumes you had a working clone to begin with). I think the problem i have got come from the version 1.7.3 of milkshape . But when i test with 1.7.2, no problem of shadow but normal are swapped. With beta5 exporter i have no problem, just unweld the model to remove the vertices over-exceded error. Look the base, there is no problem. Thanks Wes. I knew that there must be a way. I never dared to change the extracted Simpe-file name---the numbers are impressing and seems to be important. "Less respect and more playarroundtesting"... i am above 40, i should write it down and put it up on the wall behind the computer.